The nougat is a product that has been brewed for centuries in our country and has become the typical sweet in Xmas. In his traditional recipe using honey, sugar, almonds and egg, natural ingredients that make it a nutritious dessert for the organism against what many believe has more health benefits. 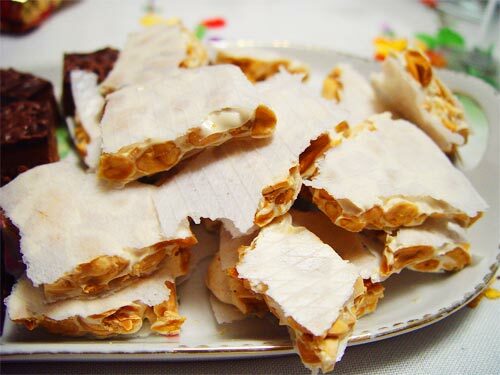 The traditional recipe of nougat remains for centuries, and today remains nearly manually because this food requires it, since the process of tabletting nougat usually slow and laborious. It is a delicious dish for the palate but full of nutrients, although it is true that abuse can be harmful, as we bring high amounts of calories while not empty at all. The nougat is a food that gives us a great deal of protein from eggs used in its preparation and almonds. Contains 7 of the 9 essential amino acids the body needs, and all of a high biological value. This makes it a suitable food for people who are looking for increased muscle mass, but yes, if not abused. Furthermore, almond nougat endow to nougat a series of essential fatty acids similar to those that we get from olive oil. Around 75% of the fatty acids are unsaturated gives us only a contribution of 10% of saturated fatty acids. To this we must add that because of the sugar and honey, the carbohydrate intake is high, so that the large doses nougat give us energy we need to eliminate through physical activity, since otherwise accumulate in the body as fat. For people who do not want to eat as many doses of sugar are in sugar free candies market for sweeteners used in its preparation. Yes it is true that these foods are essential for diabetics who can not tolerate sugar, but a healthy person should not abuse the intake of sweeteners as they may have adverse effects on the body. To all this we must add the high vitamin content has nougat. When used for processing natural ingredients provides us with high doses of vitamin E, folic acid and linoleic acid. It is also a food without preservatives or dyes, so it is all natural and healthy for the body, still the best choice to sweeten holiday meals. The nougat is a sweet dough obtained by cooking honey, sugar and egg, incorporating peeled almonds and toast, and then kneaded, which traditionally is shaped rectangular tablet or cake. The term refers specifically nougat cake making in Jijona, (Alicante), Valencia, Spain. In Latin America the production of nougat is somewhat different but have similar taste and appearance. 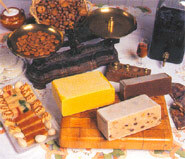 In Italy and in Denmark there is also nougat, with the names of torrone and nougat fransk respectively. In Arab countries and Israel there is also a sweet very similar and perhaps related: the sesame halva or nougat, made with ground sesame, honey, and sometimes fruit or pistachio. The process is truly traditional, although modern machinery facilitate industrial production and ensure a higher quality turronero sector continues to be guided by the same “recipe” as always. To prepare the hard nougat of Alicante, honey is cooked in a double bottom mixer, is beaten, add the sugar and egg. They are pouring the baskets of toasted almonds and skinned. The resulting paste is mixed with large wooden paddles and rhythmic movements until the master nougater test a small bite and terminating this phase, called “melero point”. The resulting mass is deposited in molds and covered with the wafer is cut into bars, cooled and then vacuum packed in order to preserve more than one year. For soft nougat or Jijona, after malaxation and churning, milled for half an hour and passed the dough for refiners to make it completely pulverized, is moved to another tank where it is mixed, then acting “Boixet” Valencian word denoting a small mortar, here the product becomes Jijona nougat. Let stand for two days to harden, cut and packaged.